Horses are highly social prey animals who use flight and physical, very athletic play to establish and maintain relationships within the herd for the sake of safety, comfort & food, and more play. People and horses form mutually gratifying partnerships when we learn their natural herd dynamics and how to "speak" the horse's universal language of energy, body movement, and position. Why Parelli? Because it is the most effective horse training and human education program anywhere! It's based on decades of experience and savvy accumulated by Pat and Linda Parelli and then, by their enormous dedication and effort, passed on to trained, licensed instructors, many of whom have studied directly with them, picking up "second-hand gold" (which is as good as new, says Pat) along the way. Pat and Linda, and their instructors, have a rich appreciation for the challenge of learning to become the human your horse needs, of the life-changing journey that often entails. You know you're "doing" Parelli when you put the relationship with the horse first, when you work to become excellent in four skill areas (the 4 Savvies of Online, Liberty, Freestyle, and Finesse), when you commit to never-ending self-improvement. 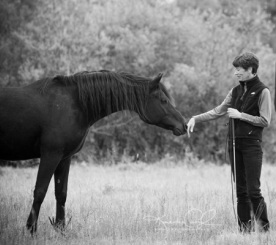 We are all about Foundation before Specialization, about developing horses who are smart, calm, and brave; calm, connected, and responsive; who are healthy and happy, keen on life, in a human world.